A rarity in craft brewing – a purpose-designed building. Anybody who has set up a brewery in BC will tell you it took a lot longer than they thought possible. There are so many hurdles in terms of paperwork, zoning and code compliance, sewage discharge permits etc., not to mention the seemingly capricious nature of building inspectors. For many of the new entries to the market in recent years, financing has not been an issue. People looking to invest in a business have seen craft brewing as a growth industry with reasonable financial returns as well as a fun thing to be involved with. Those investors have simply hired brewers and employed companies that set up breweries for them. While this business model has been around for a while, there was a time when it was much more common for a trained brewer to strike out on his or her own, maybe with one or two friends and set up their own brewery using whatever financing they could cobble together. Matt Phillips’s story of multiple maxed-out credit cards is well known throughout BC’s craft beer community. While Phillips retained ownership, there are a lot of other brewers that lost control to investors who subsequently dumped them. That’s why. Aly Tomlin and Ralf Rosenke decided early on they would retain control of their dream brewery, no matter what it took, and it took a lot out of them. The enormous grins on their faces today when you turn up at Riot Brewing are a joy to see for those of us occasionally exposed over the last 7 years to their brief flashes of welcoming smile, rapidly sliding off their lips followed by the refrain “still plugging away”. The story begins in 2009 with Aly working at R&B, but dreaming of her own brewery and Ralf, her roommate, working at an upholstery company and hanging out at R&B more than he cares to remember. As a young female brewer in a mostly-male preserve, Aly’s reputation for acid verbal riposte and junk-punch attack was her best form of defense. The pair were seriously thinking they could target 2010 to open a new brewery in Vancouver. To say that was a tad optimistic is an understatement, but they never imagined it could be a 7-year epic. That saga turned them from roommates into life partners, a platonic relationship that only Aly and Ralf really understand, and neither can adequately explain. When Aly was let go from R&B in June 2010, the dream seriously needed to be turned into reality. The word got around, and she was approached by a few investors, but they all wanted at least 51% which, for Aly and Ralf, was a non-starter. They also asked for a business plan so she set out to write one. This was the first obstacle because there is a big gap between a dream and a plan that an investor will buy into. Although familiar with most aspects of a brewery operation, she had never delved into the finances or business plans. Determined to do this herself, she spent long hours getting basically nowhere. Weeks, then months, went by with nothing solid accomplished. In June of 2012, after hearing about Aly’s abortive efforts enough times, and getting somewhat exasperated, her mum said “come over to Duncan and we will work on it together; it will take a couple of weeks.” Aly took the offer and commuted back and forth from Vancouver. Eight months later they had a workable business plan, pretty much the one they are operating on today. That was February of 2013. Vancouver had been looking less and less of a good bet and the building costs were skyrocketing. Their focus had shifted to Duncan, even before the business plan was completed. At that time, besides the two brewpubs, Craig Street brewpub in Duncan and Longwood in Nanaimo, there was only Wolf Brewing north of Victoria. Aly was a Vancouver Island Girl, from Victoria, and a return to island life was tempting. Duncan looked like a great base to serve the many towns and villages between Victoria and Nanaimo, and not too far from ferries to ship product to the Mainland. Aly moved to Duncan permanently in April 2013 and started looking for local investors; Ralf stayed working in Vancouver. Countless discussions with potential investors led nowhere, time after time. They were not serious, they wanted control of the business, or they lost interest after realizing this was not just a way to get free beer. Other breweries were opening up and our two working-class heroes were getting extremely frustrated. Aly was barely getting by, living solo on the island, with no job, no car and very few friends nearby. At least Ralf had a salary until his company announced they were laying him off. After working out his notice, Ralf moved to Duncan at the end of 2014 and ramped up the investor quest. They also started looking at buildings in the Duncan area – many of which were in a run-down state and would need a heck of a lot of work to fix up. The story now shifts to a third player in what is now the management team. One of Ralf’s co-workers Morgan Moreira became increasingly curious when Ralf started openly talking of his dream of setting up a brewery after he was given his 7-month layoff notice. 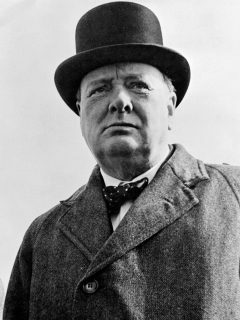 As a result of the tragic death of his father in France, Morgan had come into an inheritance and a lot of options opened up. He too liked the idea of being his own boss and had thought of something like a food truck. Ralf talked with Aly about approaching him to invest and they arranged to meet at Brassneck in January of 2015. A host of brewers, and Keith Lemke of The Seibel Institute, had turned up at Brassneck for pre-drinks prior to heading to Main St. Brewing for the Brewdog filming. Next day they all headed down to Central City cask festival. Seeing Aly among her peers, Morgan came to realize she really is a well-known figure in the craft beer community. After taking a close look at the business plan he became convinced the dream brewery was viable. Morgan says “When I came back to Canada after my father passed away, I felt like something within me had changed. I was determined to accomplish something but I just didn’t know what it was. I believe everything happens for a reason. When I met Aly and Ralf to talk about this project, I immediately shared the vision, and realized Riot was that reason.” Being a temporary foreign worker, he was only allowed to own 10% of the business, but as their first real investor, the two life partners “adopted” him and took him on as a third partner. He quit his job and put all his energy into the brewery project, though with no wages to show for it. Morgan not only injected cash but a timely dose of youthful energy and enthusiasm, plus a certain gallic charm. 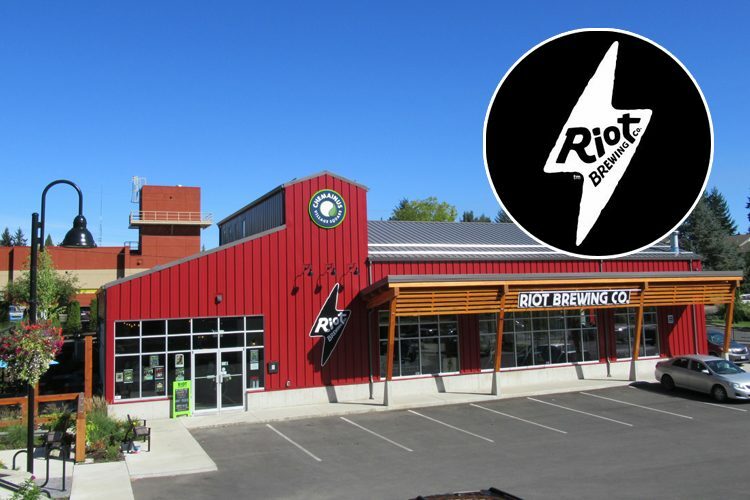 The name of the brewery had gone through a number of evolutions but Riot was always in the running right from the beginning. They had registered the name back in 2010. With the need to set up a real business they had to settle on a final name. Nobody could come up with anything better so Riot Brewing it was. Morgan’s financial injection was a pivotal moment in the saga, but 2 years of trying to set up in Duncan had worn thin. Time just seemed to be slipping away. They started considering other locations like Campbell River and even Powell River. Over this period, they had developed a good relationship with Economic Development Cowichan and the word had got around about their struggles. The second pivotal moment came with a phone call from the Head Planner for North Cowichan: “Chemainus wants you”. 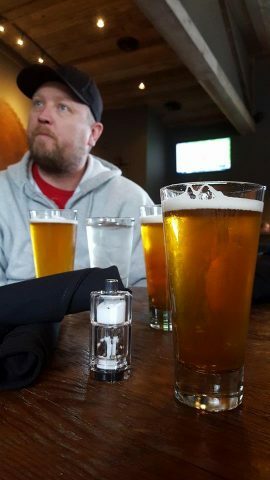 Brian Green is an English ex-pat with some appreciation for good beer and he recognized the economic impact craft breweries could have in small communities, especially one heavily reliant on tourism. Most people in BC have heard how Chemainus reinvented itself through theater and murals after the threatened closure of their major employer, the local sawmill. The Riot family barely had time to absorb this news, when they got another phone call. Brian had given their number to a local developer in Chemainus. 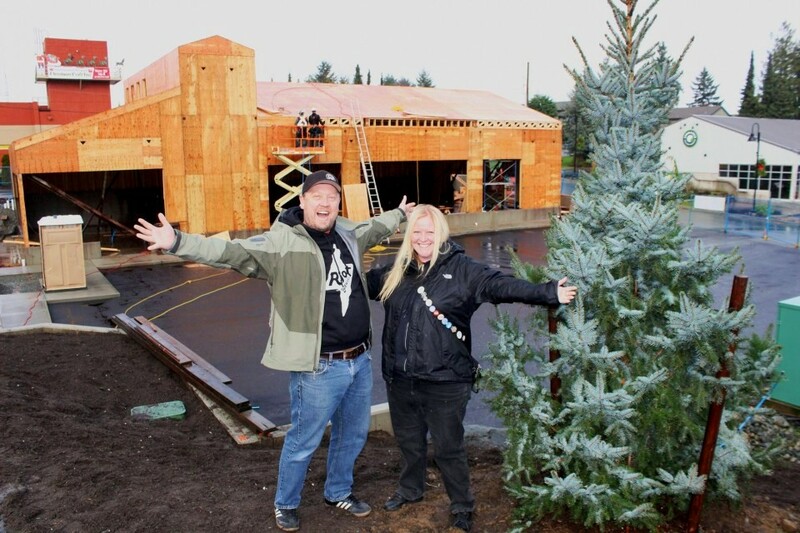 He offered to put up a building for them in his new open-air mall, which was to have an old cannery/sawmill look to it. After more discussion the developer offered them a loan to help with the interior construction of the brewery and tasting room. At one point they even had a chat with the mayor. “As soon as we decided to move the operation to Chemainus, everything started to come together” said Ralf. With other people putting their faith in the dream, Ralf’s parents took out a small line of credit on their house and pitched in. Bankers started to give them a lot more time, and they played one bank off another. Their seemingly inexhaustible reserves of perseverance and enthusiasm inspired their business banker to threaten to quit if the bank did not provide a loan. With the bank loan they started ordering equipment and, ever optimistic, targeted a November 2015 opening. They were always planning to have a Newlands system and they had been working with Shae De-Jaray. They got seriously worried when Shae decided to leave Newlands and open Deep Cove Brewing but he volunteered to continue acting as their project manager. Most of the system was ordered from Newlands but Shae got a handle on a cheaper source of fermentation and bright tanks from China which helped with the budgeting. Other breweries like Longwood, Spinnakers, Axe and Barrel, and Central City were also very supportive. Parallel 49 gave them an old keg washer and keg filler. No, they did not open in 2015. Another key component fell into place when Fabian Specht approached the team to be their brewer. The partners jumped at the chance knowing Fabi’s pedigree working with Gary Lohin at Sailor Hagar’s and latterly at Central City. He had been very happy in the brewpub but was not so keen on the move to the stand-alone production brewery. He decided he wanted a change of lifestyle with a move to a smaller town and Vancouver Island looked very attractive. Through early 2016, the building was going up, but the business still did not have enough money to get operational. The search for investors continued. What they really needed was a large cash injection for ingredients, among other things, but they also desperately wanted a canning line. At this point, Aly says “Riot Brewing was all smoke and mirrors”. Ralf and Aly were still doing Joe jobs to pay the rent. All the financing they had put together could so easily fall apart. In July of 2016, a couple stopped by the building to see what was going on in that corner of the mall. They later phoned and talked about investing enough capital to get Riot operational, but not affording them the ability to buy the canning line. They got their daughter and son-in-law involved in reviewing the business plan and after a lot of negotiation the couple and their son-in-law said “we will invest more than we had initially considered, but only if you go back to your original plan and buy the automated canning line. That cash injection was the final piece in the puzzle, Ralf, Morgan and Aly still had to complete their own interior construction, other than plumbing, electrical and other building code compliance aspects. The tasting room alone is a testament to their design and construction skills. Riot started brewing on October 3 2016 and had its ultra-soft opening on November 10th 2016. They did not even tell their friends and family because they were so apprehensive. Their first brews were Lipslide Lager, Junk Punch IPA, Life Partners Pale Ale, Working Class Hero Dark Mild and Sorry We Took So Long Saison. Aly says she lets Fabi do what he wants with beer recipes. They have no small-scale system so test brews are full production sized. Fabi says “why bother with the problems of scaling up”. That hands-off approach seems to be paying off. They won silver at the 2017 Canadian Brewing Awards for their Good Vibrations Classical Pilsner. Fabi played classical music to the brew in the fermenter and the bright tank for 8 weeks through his primeVibe guitar seasoning device. Sound nodes were attached to the tanks and the music resonated throughout the beer. 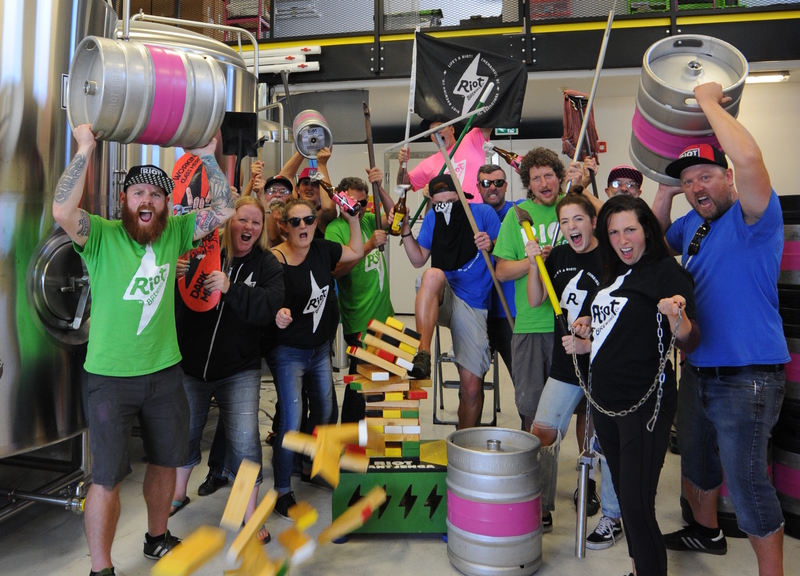 Ralf says “it was surreal walking into the brewery late at night and hearing that music echoing around the building”. The story by the local CTV station was picked up across the country, raising their profile enormously. It is amazing how fast the brewery has fit into, and changed, the local community. Triggered by the availability of local brews, the developer decided to add The Sawmill Taproom to the mall. In addition to beers from across the parking lot, they have an eclectic selection from across BC. Riot’s growler sales have really taken off and local real estate agents are putting “walking distance to the brewery” on their property details. Perhaps a coincidence but there has been another resurgence in new local businesses and people moving into the area. Property prices have gone up so much, their staff, mainly refugees from Vancouver, have trouble finding affordable accommodation. 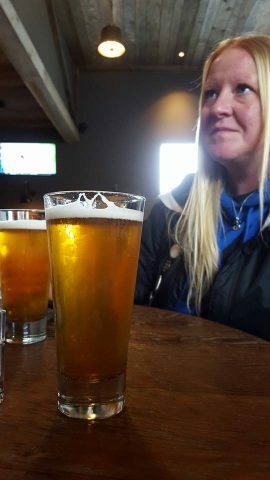 Other elements of the community were slower to embrace craft beer but you can now find Riot Brewing Taps alongside Lucky Lager in the Shoe pub and the Green Lantern, south of town on Chemainus road. You do have to know where to look for the brewery, since it is not visible from the road. Locate the Sawmill Taproom at the northernmost of the two traffic circles in Chemainus and drive into the mall entrance just down Oak street. The purpose-built structure is beautifully designed with a tasting room, shaded outdoor seating and space in the brewery for expansion. They don’t serve food but there is great pizza, available as take-out, from the restaurant. Most nights of the week they host events in the lounge ranging from musical acts to comedians and magicians. 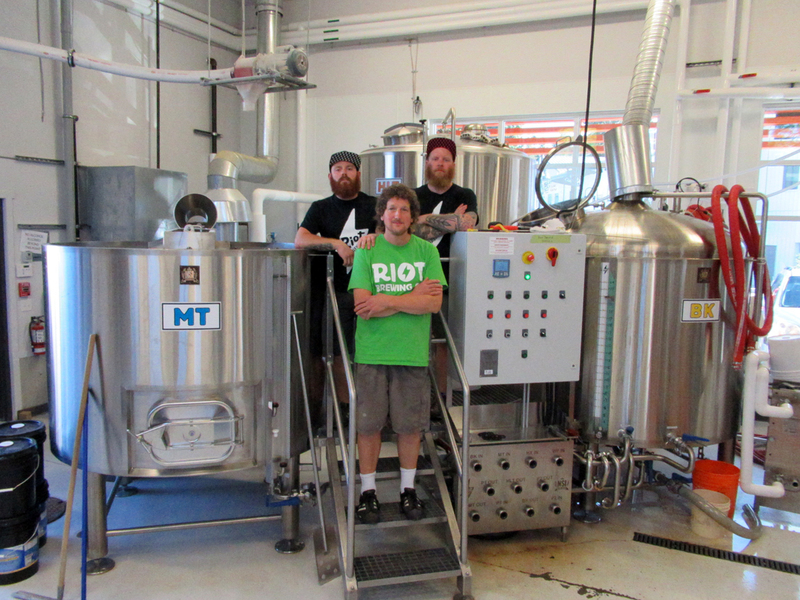 Riot Brewing is a fascinating study in contradictions. Aly still wears a hoody, but these days she sits on the board of Chemainus Chamber of Commerce. Riot has a skateboard/punk theme, while supporting community events, including The Riot Cup hockey tournament. Their logo is branded onto both temporary tattoos and dog biscuits. 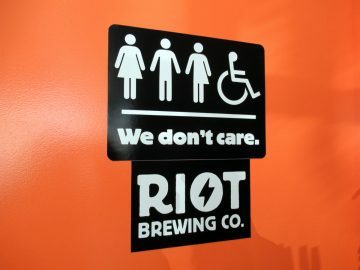 Their bathroom signs gained appreciation from the LGBTQ community and the mobile in the tasting room was made by the local art teacher. They make beer, and they work with dry grad. While their beers are on-style sessionable ales and lagers, their labels are wild and crazy. If you did not know the background, you would think they were just a pastiche of skateboard art, but the real story is a lot more authentic. The partners outlined what they were looking for to a marketing company specializing in craft breweries in the USA. That company got in touch with Jimbo Phillips from Santa Cruz, legendary graphic artist in both the skateboard, and punk rock scenes. He agreed to branch out into beer labels. Aly, Ralf and Morgan are personified in so much of what Riot Brewing does – ownership does have its privileges. Aly approached me to write this story for What’s Brewing because we have known each other for around 15 years. 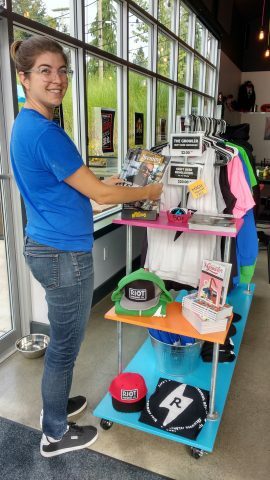 I recruited her to fill the newly-created role of Industry Liaison in the first executive committee of CAMRA Vancouver. Ralf basically came free with the package and was the first Secretary. When she was at R&B, Aly set up the second regular cask night in Vancouver at The Whip Gallery and Restaurant and I am still a Sunday regular. I have also followed Aly and Ralf’s progress, and lack of progress, following their dream for the last 7 years. I have a particular affinity for people who succeed through sheer dogged hard work. I visited Riot to interview the team on the way back from the Great Canadian Beer Festival this year. It warmed my heart to see the dream come true. Disclosure: After accepting a writing assignment and submitting this article, the author was inspired to become a minor investor in Riot Brewing. J. Random has been penning the Ullage & Spillage column for What's Brewing since 2003.